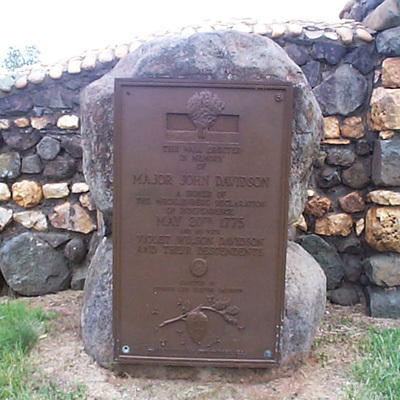 The memorial wall to Major John Davidson was constructed from rocks taken from the foundation of his Rural Hill Plantation house that had burned in 1886 and the Catawba River. The wall was constructed in layers of different colored stones. The bottom layer is of dark stone, the second layer of light stone, and another layer of dark stone with a thinner top layer of smaller light colored stones. Two stone pillars with an iron gate form the entrance. Each pillar is topped with a large white rock. A large pillar, also topped with a white rock, forms each corner and the wall rises as it nears the outside corners. 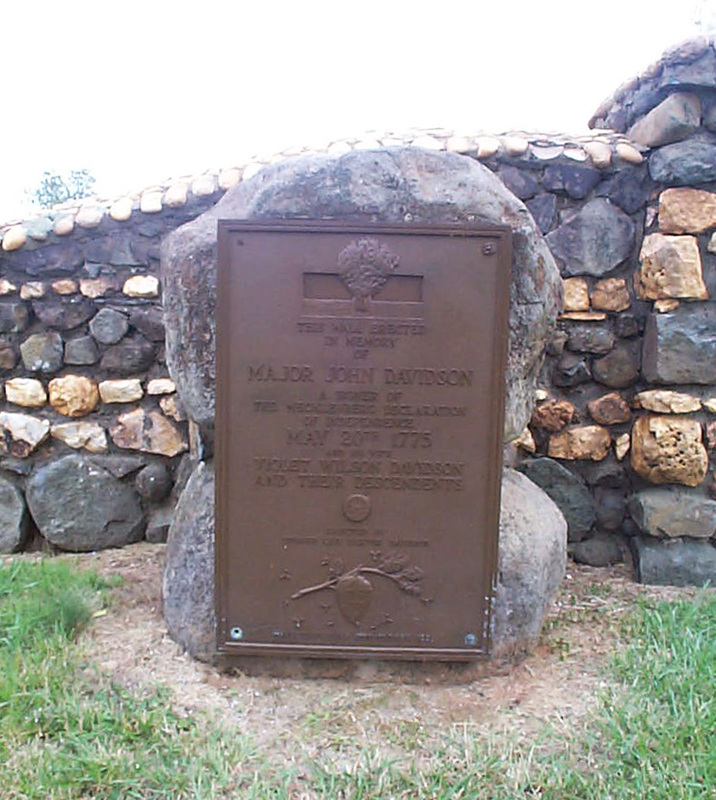 Outside of the wall at its right corner (when facing entrance) stand two boulders, one stacked upon the other, to which a bronze plaque is attached. In relief at the top of the plaque is a tree holding a hornet’s nest with hornets buzzing. Below is the inscription along with the insignia of the Sons of the American Revolution. At the bottom is a larger hornet’s nest attached to a tree branch with hornets in flight. The wall was the project of E.L. Baxter Davidson who in 1923 undertook the project of restoring and landscaping the Davidson family cemetery. Rural Hill serves as a historic site, nature preserve, farm and location for cultural events. It was the 1760 homestead of Major John Davidson, a Revolutionary War hero and signer of the Mecklenburg Declaration of Independence. Several porch columns are all that remain of the brick plantation house which burned in 1886 although many other buildings from the period remain and are in use by the historic site. Rural Hill is also home to The Bethesda Schoolhouse, one of the area’s first African-American schools built in 1900. 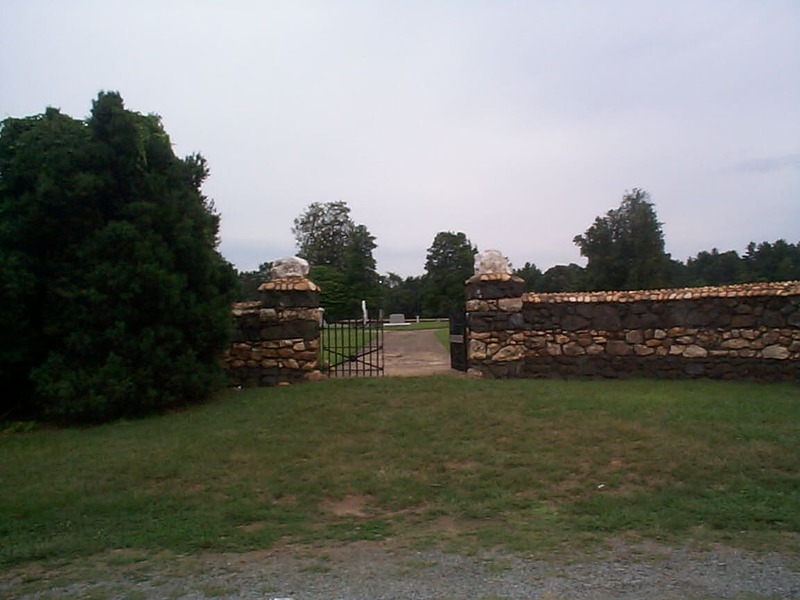 The cemetery where the wall is located is part of the Rural Hill Historic site at 4431 Neck Road in Huntersville, NC. 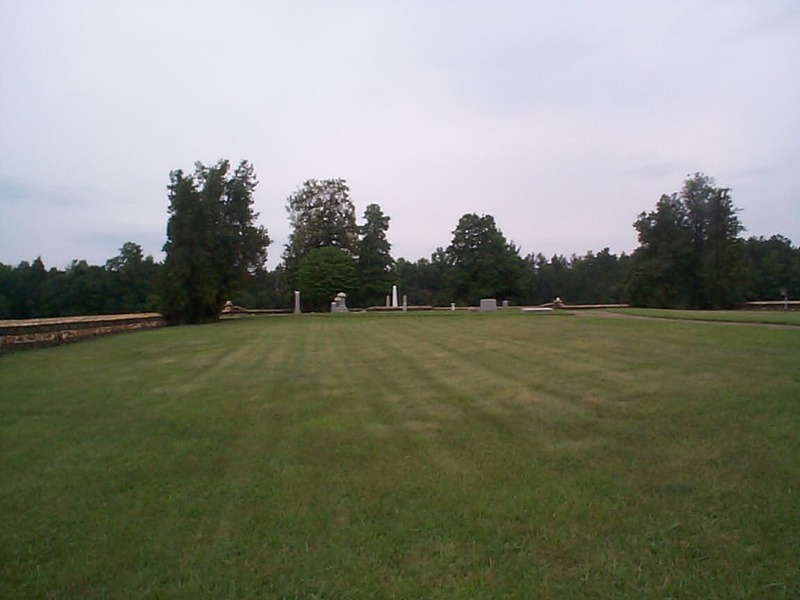 The cemetery entrance is across the street from and west of the historic site entrance. The memorial wall is surrounded by a well-maintained lawn and beautifully designed landscape.